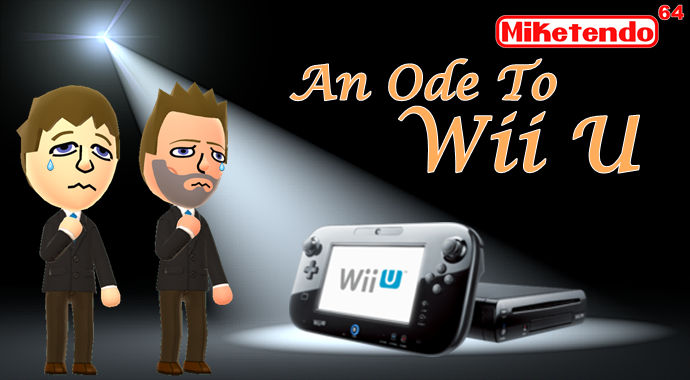 If you have been following us this month, you’ll know full well that recently we’ve been doing a series of interview posts entitled An Ode to Wii U. Interviews which saw us talk with various developers on what they thought about the Wii U, that was then posted separately, but when we first come up with An Ode to Wii U, we actually wanted to post it as a singular piece and promised to do just that. Jay Kidd: “I love it, and to be honest, most of the rest of our team does as well. I often tell a story about how when I first saw the DS and Wii shortly after each of their announcements, I was incredulous (at best) about them, to the point where I didn’t pick either of them up until about a year after they released… where I then fell in love. I started to with the 3DS as well, but ended up picking it up about 3 months after launch; but when I felt that same sense creeping up on me about the Wii U, I actively told myself to “stop it”! I picked one up on day 1 and never looked back. I love the thing. Despite its flaws (and there really are some). The understocking was another big problem. We saw that again with Amiibo and NES Classic. Not good! There was also the issue with system-based purchases (as opposed to account-based) in the beginning. The whole roll-out was a mess! A lot of people talked about how it never seemed like there were enough good games for the system, and I’d have to disagree with that. There’s also this talk from fans, not the developers themselves, about how “hard it was to develop for”. Both just simply aren’t true. They also talk about the power of the console, though if you look through all the past generations, the weakest console tends to sell the best. Adrian Vega: “I don’t own a Wii U myself, but I would like to because I love the Pikmin series and I want to play the Wii U game, as I haven’t been able to play it yet. I’ve played the GC ones a lot of times!! I even completed Pikmin 1 back in day with all pieces in less than 30 days! I remember feeling like a hero back then. Alex Rushdy: “As a gamer, I had a blast with the Wii U. There was no shortage of fantastic exclusive titles that appealed to me. I live for stuff like Bayonetta, Wonderful 101, Splatoon, Swords and Soldiers II, and quirky indie games. So for me the Wii U was right up my alley. But as a developer that was also a problem. I recognize that my tastes in games are… Well, let’s just say specific. I also loved the Dreamcast and so much that came out for it, and it wasn’t successful either. Despite the Wii U having a library of games that directly appealed to me, it certainly didn’t appeal to the mass market. So as a developer, the games you make have to appeal to that niche gamer and they also have to be low cost because the Wii U was always a super risky proposition, even back in 2014 when we started and the race wasn’t over yet. Adrian Vega: “It wasn’t easy to be honest with you. All the documentation is old and so is the tools… The specs wasn’t great either but if you put some time and effort into it, you could produce some pretty good games! Also if you compare it to its direct competition, it was the weird kid we all went to school with, the one that stood out due to its 2nd screen that you always needed to put extra effort in, or make some design choices for it that you didn’t need for PC or the other TV consoles. But still, if you put the effort in, the game would end up looking pretty damn cool! Alex Rushdy: Thanks to Unity, and generous technical support from Nintendo alongside a talented tech team here at 13AM, developing for Wii U was fairly smooth. Not without its issues and hiccups, sure (we were the very first Unity game to incorporate online play- no small feat) but as a studio we are really comfortable with the machine. The publishing processes needed a lot of work, but that is something we have seen Nintendo put serious efforts towards improving constantly. Jay Kidd: “It’s no secret that Wraith started out as a group of friends. So when I talk about my “friends” playing on the Wii U, a good chunk of them are team members. My best friend, Thorne, fiancée Kristy, brother Cody, writer Eric, programmers Natalie and Adam, and even former programmers Kyle, Geoff, and Julie would play (as well as many of our other friends), would spend HOURS playing Smash, Mario Kart, and Nintendo Land together. Throne, Cody, and I still play quite a lot of the three Mario games, Donkey Kong, and Kirby together while passing the controller back and forth with Zelda, Shovel Knight, and even the new Shantae game (the Kickstarter rewards were just sent out and it’s what we’ve been playing this weekend whilst sick). .I could go on and on about all the exclusive games I loved and whatnot, but I’d like to point out something that few people talk about: The UI. The Wii U user experience and interface is, IMO, a head and shoulders above its competitors. Not perfect, but much better. I know what to do on Wii U and how to do it without thinking. It follows the user-friendly, clean philosophy of companies like apple and throws as little as it possibly can between you and the content you want to use. *For anyone wondering why there was no response by Adrian Vega for this question, as previously stated in an earlier, he doesn’t own a Wii U, hence why there is no answer from here in this section. Jay Kidd: “Like I said before, I get a Nintendo system for that magic that it has. The ability to sit down and feel like a kid again (even with the more mature games… there’s just this “spark”, you know?) We have a PS3 and PS4 on site and I have played the Xbox One, but there’s really no comparison. To me, personally (and I don’t really speak for the rest of the team on this) but Sony and Microsoft are just making more limited, locked down gaming computers. I have a gaming computer; I don’t need a PlayStation or Xbox. Adrian Vega: “Well the Wii U is different, like I mentioned earlier. It was a different kind of platform, so when developing for the Wii U, you needed to bear that in mind. Alex Rushdy: “You know, there are loads. Despite owning all consoles and a PC, I definitely spent the most time on Wii U…I really fondly remember playing through Captain Toad and just going “Wow, this is such a tightly designed, snug and warm little game.” It was like curling up with a good book next to a fire. There were these transition moments between chapters where you could just walk around a bit and soak in the scenery, and I just kinda sat back for a few minutes and relaxed. It was a magical moment. A huge thanks goes out to each of the guys for sending their answers in, because yes the console is a financial failure, it doesn’t mean gamers didn’t appreciated it and as evidenced above, even developers appreciated the console for what it was. This is a series that for me personally, has been great fun to cover and if the chance comes to continue it before the Wii U vanishes completely, comes my way, I’ll be more than happy enough to do so, but until then, this is all for now. Thank you for reading and have a spectacular New Year!